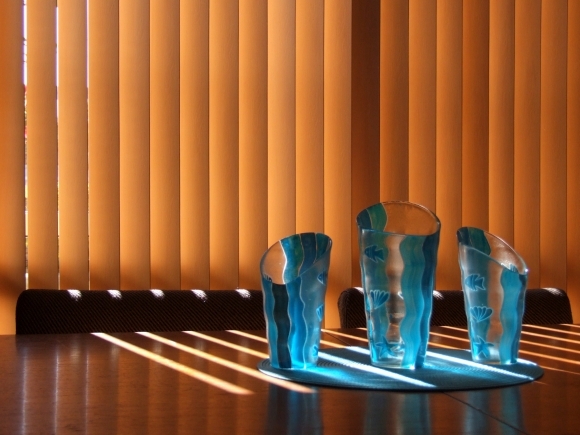 There are so many different ways to shade your windows these days, it can be difficult to know what to choose. As an alternative to curtains, blinds are suitable for all types of windows, owing to the variety of styles and features available; they can be much more practical in terms of light-control and have a very contemporary visual appeal. Whether you pick Roman shade, sheer fabric, vertical or roller blinds very much depends on how they will be used and the look you're trying to create. So here is a quick run-down of the different types of blind, and where in the home they are best suited. As a quick, off-the-shelf purchase, roller blinds are an extremely effective covering. They're lightweight and easy to operate, perfect for rooms like the kitchen or bathroom. They're also one of the cheapest blinds available and if you're fitting a fairly standard-sized window, this may be the best way to go. With many stores offering striking prints and a whole spectrum of colour options, they can fit in with almost any kind of décor. However, large or awkwardly-shaped windows tend not to be suitable for roller blinds, which may crease over wide areas and are not usually available in made-to-measure sizes. These blinds are one of the staples of home decoration and work well in most traditional homes and cottages. They can be adjusted to let in varying degrees of light and, for this reason, are popular for use in bedrooms. Horizontal blinds come in many different materials, from low-cost aluminium and faux-wood to real timber such as walnut. Again, these are not best-suited for wider windows, particularly as the wooden versions can be heavy to pull up. Vertical blinds were once just the mainstay of the workplace, but homeowners are often attracted by their clean, minimalist look which slots in with a lot of contemporary interiors. As they can be created in any width and are easy to adjust, they are ideal for large windows or bays. They're usually bought in fabric or vinyl and can therefore be jazzed up with your choice of pattern or colour. Bear in mind that they do not suit all kinds of home, so if you're looking for something cosy for a living or dining room the functional aesthetic may not appeal. A more pragmatic variation on curtains, this classic home feature can bring a touch of softness to a room and look attractive whether tucked up or let down. Like rollers, they offer a lot of scope for different prints and materials and can look both ultra-modern and vintage-inspired. They can be fitted to most window types and offer scope for creativity - for instance, separate Roman blinds around the panels of a bay can make for a striking look. Like most aspects of interior décor, personal preference is a major factor here. Within the categories above, there are other things you might want to consider, such as shades backed with PVC to create a blackout for your bedroom or TV room, or sheer material that allows you to enjoy the view without compromising on privacy. After installation, you can even add touches like a valance or curtain pelmets. Whichever way you go, make sure you measure the space accurately and think about how you'll use them on a daily basis to ensure that you get the most out of your new blinds.